May 4th - 25th, 2019. September 7th - 28th, 2019. November 23rd - December 14th, 2019. All our 200 hour courses are registered with Yoga Alliance and follow their curriculum guidelines. This course meets and exceeds the criteria set forth by Yoga Alliance for a teacher training course. We offer you a unique opportunity to deepen your own yoga practice and gain the skills and confidence to teach your own yoga classes. Students will learn to teach Ashtanga Vinyasa, Hatha, and Shivananda Yoga styles deepening their own understanding of Yoga and enhancing their professional yoga teaching careers. Unique to our course we limit enrollment to a maximum of 6 or 10 students per training. This way we can offer more individual support and practical training to each student. Our teachers and our homey venues lend to a more intimate experience for our students. The course includes daily pranayama, mantra chanting and asana practice to help each student enrich their own practice. Lectures and practicums on Yoga philosophy, ethics, anatomy, and physiology, teaching methods will be covered in this course. Successful graduates will receive a diploma and are eligible to register with Yoga Alliance as 200-RYT. Students enrolled in the Yoga with Horses will receive the same diploma in addition to a certificate from Yoga in Harmony with Horses: Equine Yoga Teacher Program certification. Suited to all levels of yoga experience. Teacher Terry at Playa Cocles beach. Terry then went on to complete her Yoga Therapist Certification from IAYT. She is also a certified Metaphysical Energy Healer and Jin Shin Jyutsu practitioner. Her studies include the use of Essential Oils, medicinal plants, tinctures, essences and clays. Terry Newton, host and Yoga teacher, with Nahar, andalusian horse. Terry now introduces her horses into her YTT classes for meditation and energy healing, for her students to experience this unique way of learning to be in the moment, creating awareness and presence in mindful meditation. As a passionate nature lover, Terry incorporates the surrounding jungle, the giant trees and powerful energy into her daily classes for all to experience. This YTT is your opportunity to learn the techniques and methodology for guiding yoga practice with awareness of how to Live the Yoga Philosophy. Through this training you will engage in a physical practice and thought provoking discussions, receive the light to explore your inner being; discovering your true self as you bring your awareness to your layers of conditionings and the Samskaras. The transformation will leave you energized, confident and ready to follow your inner calling. Daily journalling is encouraged and homework may include your personal writings or we will choose a yama and niyama and you will be asked to contemplate and share life challenges while living the yamas and niyamas. The learnings of mantras and chanting, walking meditation, silent time, and Sanskrit names of the asanas are part of our training. You will learn how to teach, how to guide and share your yoga practice, built on the foundation of your own practice. The yoga training is to prepare you for sharing and leading yoga sessions, as well as incorporating the balance of mat yoga into your life and the lives you touch. Respect your housemates by: not playing music they don't like, being quiet when others need to rest, taking your phone-calls outside, not taking too long in the shared bathroom, washing your dishes and doing your best to keep your space clean and organized. Be polite and respectful towards every person you encounter during your stay. That includes every student, volunteer, teacher, worker, neighbor and host. Out of consideration for your classmates and respect for your teacher, always arrive on time for everything in the program: yoga, classes, meals, trips to the beach, etc. We have four nearby houses available for your stay. All houses include equipped kitchens and are located within our gated communnity. Please visit our accommodations page to read all the details and make your choice. Includes all lunches, tea time & water (except on Saturdays). Weekly trip to the store where you can purchase all your food supplies. All meals are fresh organic and vegetarian always, as well as vegan when someone in the group is vegan. Includes all yoga mats & props for use during courses, horses during classes. We all (volunteers, interns, guests and me) come together at the main house for lunches and dinners. 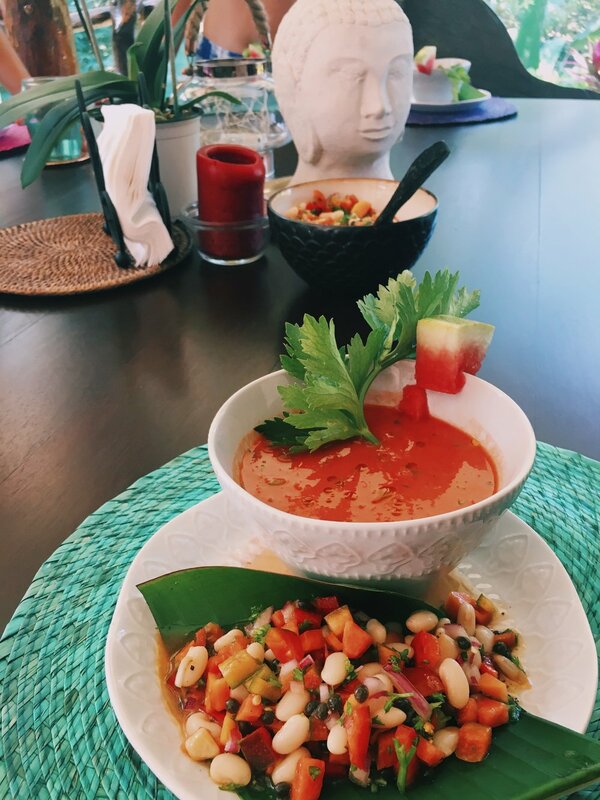 Typical lunches include Gazpacho with a salad, Buddha Bowls, Burrito Bowls, Summer Rolls, Vegan Tacos, etc. Fresh ingredients will vary seasonally. Up to 1 month before the first day of the Training, 50% of the deposit is retained. If you cancel with less than a month’s time before the Training, there are no refunds. If not enough students enrolled and the Training is cancelled, full refunds will be given shortly.